The Local Government of Camarines Sur, led by Governor Luis Raymund Villafuerte Jr., has organized a tree planting activity wherein 50,000 trees will be planted on governmentacquired land. In an attempt to feature the value of Pagkakaisa, this area, now called the “Community of Hope”, serves as a home for rebel returnees and military families. A 40-hour vigil will be held starting on the 23rdup to the 25th will be held in 25 churches across the country. A live concert will be held that will showcase various Filipino artists from the Kapuso,Kapamilya, and Kapatid networks. The variety show is divided into five (5) suites: “Simulain, People Power History 101,” “Ang Diwa, the Spirit of EDSA People Power,” “Mga Simbolo, People Power Lives On,” “Mga Bayani, the Heroes of Today,” and “People Power Ngayon, Nation Building Today.” The PANA Ad campaign will also be launched at the concert. A fireworks display will follow the concert. 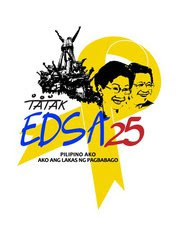 This event is in recognition of the personalities who played significant roles during the EDSA People Power Revolution. The awardees are: (Living) Fr. Reuter, Nap Rama and William Esposo, and (Posthumous) Don Chino Roces, Rep. Stephen Solarz, and Teodoro Benigno. Lunch will be served and the film entitled “The World Remembers EDSA” will be shown. Music will be provided by Mr. Ryan Cayabyab.